I've always love caricatures but have got no idea where to get it in Singapore until I came across your blog! All your work is really awesome! Since my best friend's 21st birthday is coming up, I'm sure this would make a perfect present for her as she once commented she want to have one too after seeing mine done from my Japan trip. Hmm.. I would like to do the Caricature in colour marker with theme - with background & body. 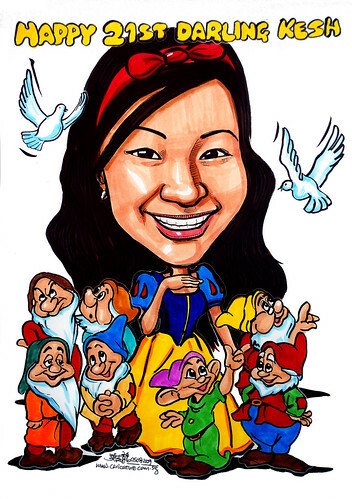 My best friend loves snow white and the seven dwarfs, so I want her to be the beautiful snow white princess surrounded with 7 dwarfs. maybe with a tiara? and everything to end up to have a very fairytale and princess-y theme! I want the wordings to be "Happy 21st Darling Kesh" "
First time drawing the 7 dwarfs. Their basic features are the same, but with some changes here and there, if you study them closely.